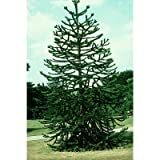 Monkey puzzle plant for sale – is in the form of tip cuttings grown from a nursery. 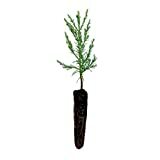 It is not recommended to start growing this tree from seeds as it will take at least 2 months to germinate and the chances of successfully growing a seedling is low. The monkey puzzle is a very slow growing tree that can take 5 – 10 years before it even gets above grass height and then grows around 35 cm a year. In their natural state, monkey puzzle trees become as tall as 60 to 70 feet with a spread as wide as 35 feet. Monkey puzzle plants are considered dioecious which means each plant has either male or female flowers. Its large and edible seeds are enclosed in a cone and may take 2 years to mature and are then pollinated through the wind. One special feature of this tree is its fire resistant bark. Location – The tree grows best in a mild climate that receives a good amount of rain, or at least an area which mimics these conditions. Choose a location with full sunlight. It can also do well with salt sprays and can grow near the ocean but avoid placing your monkey puzzle tree in a hot, dry climate or polluted areas. Soil – The monkey puzzle tree will thrive in well-drained, slightly acidic, volcanic soil but will tolerate almost any soil provided that it has good drainage. It dislikes hot dry soils so make sure to keep the soil moist at all times but never soggy. You can also plant the monkey puzzle in a container with a well-draining houseplant mix. Fertilizer – Monthly fertilization with a balanced houseplant food is needed to grow a healthy monkey puzzle tree. You may also use a micronutrient spray 1 – 2 times a year. More fertilizer is needed if you observe pale new growths. During period of dormancy, stop feeding your plant. Pollination – Plant at least 2 trees in your garden if you want to pollinate and eventually harvest seeds. Make sure to plant one female and one male tree. Pollination is usually by wind. However, the monkey puzzle tree does not yield seeds until it is around 30 to 40 years old. A group of 6 female trees with 1 male tree for pollination could yield you several thousand seeds per year. Pruning – Avoid pruning growing branches. Just cut off dying lower branches. Also prune the roots before repotting monkey puzzle trees that are grown in containers to limit its growth. Harvesting – The seeds are usually picked after 2 years. They are large and similar to pine nuts and about the same size as almonds. They are either eaten raw, boiled or roasted. You can also mill the seeds into flour and use to make bread or ferment beverages. However, it is not a good idea to stand under the tree when it is dropping its cones because they are big and may weigh a several pounds.